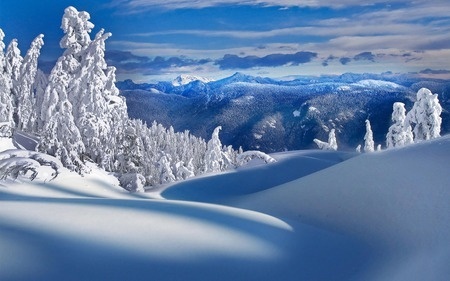 For some skiers, mention the word mogul, and their knees involuntarily creak, as they recall plowing over, under, around, and though “the bumps” (enormous man made mounds of snow) whether they were standing upright, or falling end over end down the mountain. 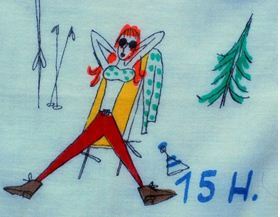 Others envision a different concept of “mogul.” When I lived in Denver in the 1970’s, I remember a reporter in Aspen approaching a group of gorgeous, model-like women “lunching and sunning” on the deck. 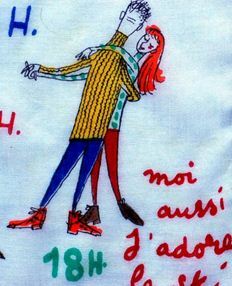 Their outfits were not only supremely expensive, but pristine, as though they had never taken a fall. The reporter approached and asked “Have you ladies been dueling with the moguls while you’ve been here?” “Oh yes,” they responded, “the place is crawling with them.” Looking puzzled, the reporter inquired “Can you tell me what a mogul is?” One blond beauty actually raised her hand like a schoolgirl and said “I know, I know.” “Yes?” “They’re rich guys with big cigars.” Ooooooo-kaaaaayyyy. 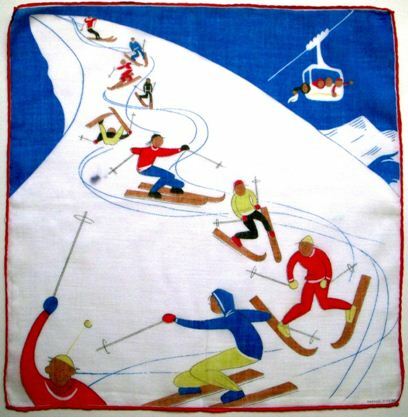 Although at first glance this may not look like a ski hankie, it immediately brings to mind the charming town of Aspen at the height of summer, and home to ski bunnies year round. Originally a mining camp founded during the silver boom of the 1880’s, Aspen’s main drag leading into town is still today lined with Victorian homes with wrought iron fences exactly like those pictured here. Note the trees are high altitude pine and the statue is a deer. 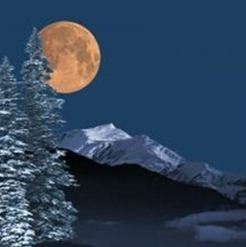 Indeed, methinks we’re viewing a summer sojourn in the rockies. 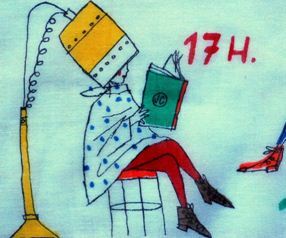 This “Day in the Life” hankie gives us the rundown on the hectic life of a busy bunny. 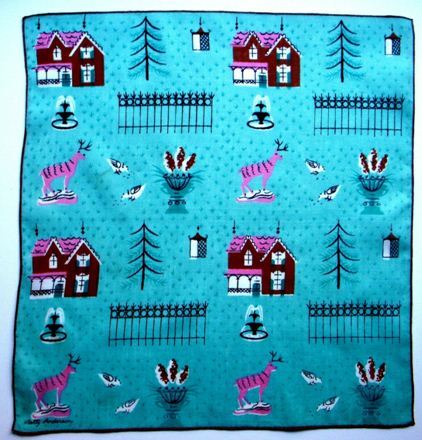 From the cuckoo clock to the checkered down duvet to the charmingly painted furniture we can surmise this bunny is vacationing in the Swiss Alps. Our bunny rides up the mountain on the chairlift. Note the sun is already high in the sky as it’s 1:00 pm. She isn’t dressed too warmly, but we needn’t worry. Why? Because it’s time for an afternoon break. 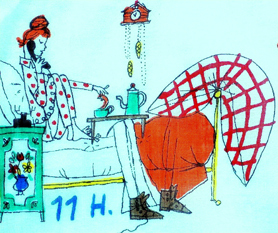 Lest milady get too weary, it’s best to extend her brief rest into a full blown nap. And why not work on her bikini tan while she’s at it? 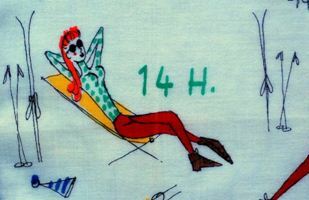 These were the days of Bain de Soliel, rather than SPF 50. After a day of exertion, time to head back down the slopes. 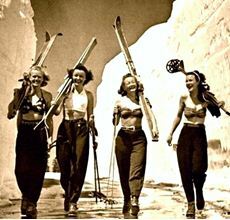 Ski down, you say? Don’t be ridiculous. There’s a perfectly nice chair available. 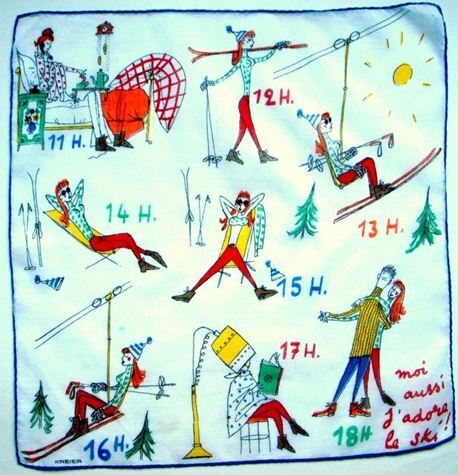 This hankie immediately brought to mind the 1964 Blake Edward’s comedy The Pink Panther filmed in Cortina d’Ampezzo in the northern Italian alps. Claudia Cardinale plays a princess who owns the largest diamond in the world. 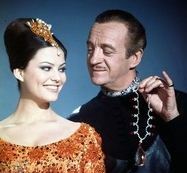 David Niven, her companion and suitor, is actually a famous jewel thief known as the Phantom. Peter Sellers is hilarious as the bumbling Inspector Clouseau. 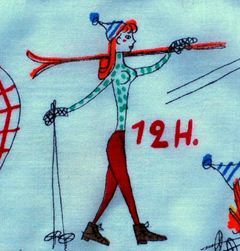 And of course – the resort is bursting with ski bunnies, including women on the slopes in full length fur coats! 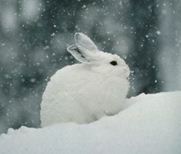 Back to our very own bunny – time to freshen up before dinner with “the works” at a salon. 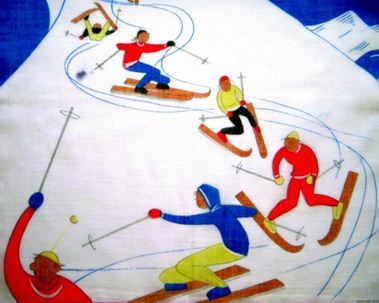 The majesty of the mountains has always held an allure for skier and non skier alike. Icicled trees and gently falling snowflakes call for snuggling by a toasty fire. 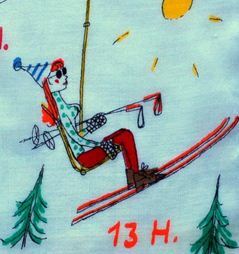 Come morning, the brilliant blue of an alpine sky and bracing cold breezes call for fun on the slopes. 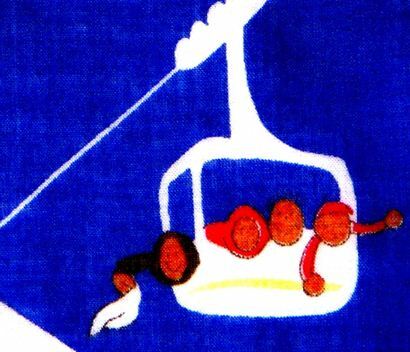 This colorful graphic from the 1960’s replaces the rope tow with an aerial tramway, the height (no pun intended) of transportation in snowy weather. The mountain peak, starting in the corner, eventually envelopes the page, and is a powerful image to anchor a mountain full of skiers. 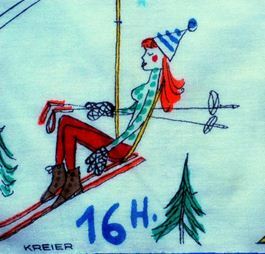 A skier on the aerial tram waving his very own white hankie at his pals on the mountain. 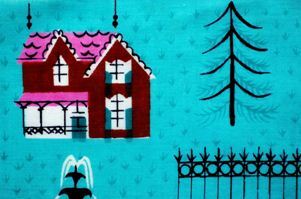 A hankie within a hankie. Truth be told, that’s what clinched it for me. Just had to have this one!